William Shatner in SHATNER'S WORLD…a one man force of nature delivers a larger than life performance complete with his laugh-out-loud humor, signature storytelling and select musical selections in his inimitable style. The performance is presented as WRCH’s 19th Annual NITE OF LITE LAUGHTER, with proceeds to benefit the fight against Breast Cancer through the Hartford Health Care Cancer Institute at Hartford Hospital. VIP tickets include an offsite WRCH reception. William "Bill" Shatner (born March 22, 1931) is a Canadian actor, musician, singer, author, film director, spokesman and comedian. 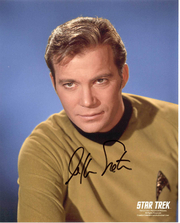 He gained worldwide fame and became a cultural icon for his portrayal of Captain James Tiberius Kirk, commander of the Federation starship USS Enterprise, in the science fiction television series Star Trek, from 1966 to 1969; Star Trek: The Animated Series from 1973 to 1974, and in seven of the subsequent Star Trek feature films from 1979 to 1994. William Shatner is currently considered a "single author." If one or more works are by a distinct, homonymous authors, go ahead and split the author. William Shatner is composed of 3 names. You can examine and separate out names.